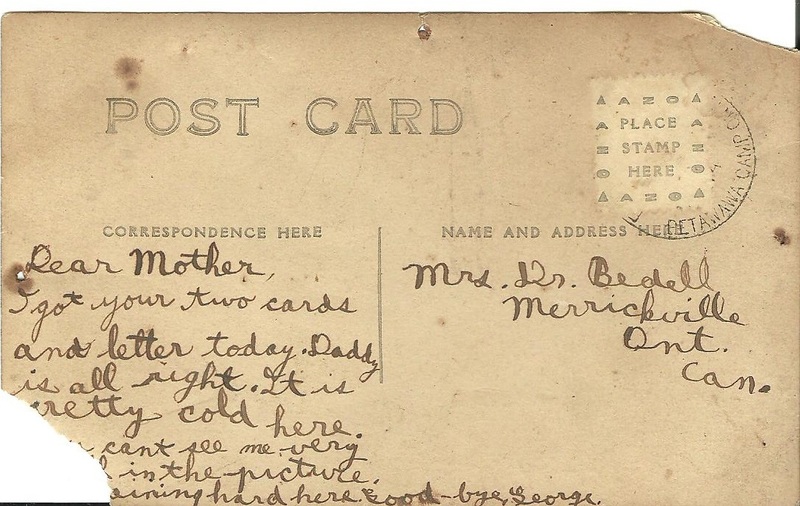 A letter home; grandfather to his mother in Merrickville, Ontario. The journal says that they traveled to England in 1916. She and her daughter (Beatrice) must have gone home at some point. Leaving grandfather to remain in England. He must have been close to signing up for the war; by my tally he was sixteen on the boat over and probably seventeen in this picture. I assume it is a year later. Did this photo make his mother proud, or fill her with fear? Perhaps both. There is a hole in the center at the top of the postcard- someone loved this enough to pin it up. Sadly, I am unsure which man my grandfather is. I do know his face and what he looks like, but as he says in the postcard, it is hard to see him. 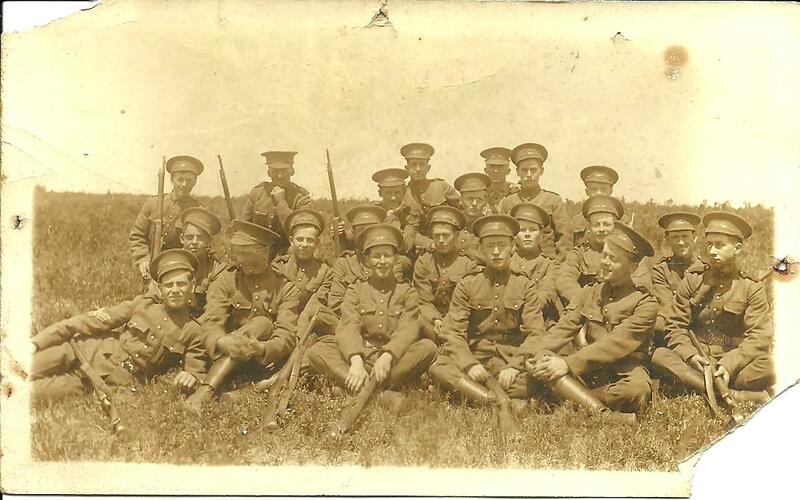 I believe he is the young lad on the top right who has lost his smile to the hat of the gent in front of him. It would be amazing if someone could find their own loved one amongst these faces; time is shadowing the possibility, the photograph is almost a hundred years old. This entry was posted in Grandfather's journal 1919, historical, historical media, history and literature, old photographs, primary resource, World War One and tagged Canada, England, Merickville, old photo, old postcard, Ontario, primary document, training for the war, World War One, WW I. Bookmark the permalink.